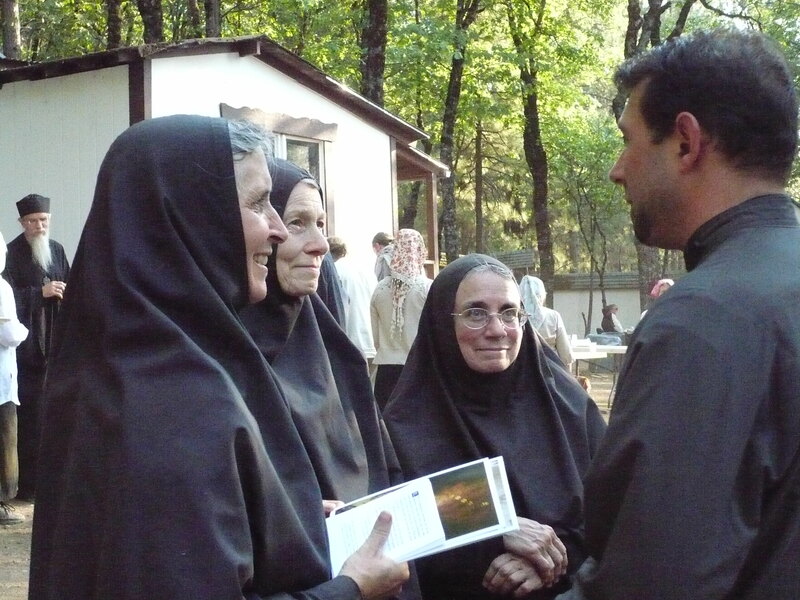 I was recently blessed to attend the 30th Anniversary of the Repose of Fr. 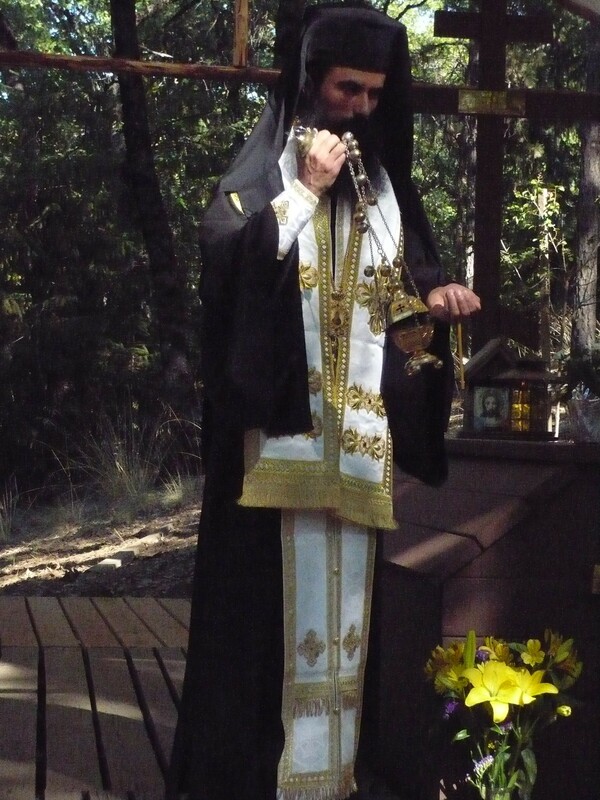 Seraphim Rose, one of the founders of the St Herman of Alaska Brotherhood in Platina, California. An experience like this is always difficult to put into words for much is absorbed by the heart and the spirit, which words cannot express. The tone for the weekend was festive and joyful and each participant whether young or old, monastic or layperson was caught up in the peace and tranquility of the moment. We arrived at 6pm Friday evening and were immediately greeted by a young monk who wanted to make sure that we had places at the evening meal that was presently taking place. This sense of hospitality and graciousness was felt throughout the whole weekend, whether the monks were taking care of our hunger or a simple place to lay our heads at the end of evening prayers. Compline was read and we all settled down for some sleep and many of us to prayer. The moon was full and as it rose over the cemetery it cast an ethereal glow upon the crosses that dressed the 30 or so grave sites there. It was a sobering thought and nostalgic to remember our dear ones passed on and that this would be the place in which they would rise at the Last Judgement. But now things were resting in a deep and dreamless sleep. As the moon was setting, the bells for morning prayers began. For us laypeople, rising at 4pm is always a bit of a challenge, especially after a long drive the evening before. Fortunately our angels gave us a quick kick, reminding us why we were there and once inside the cathedral the mind and heart were quickly caught up in the ancient and familiar prayers. 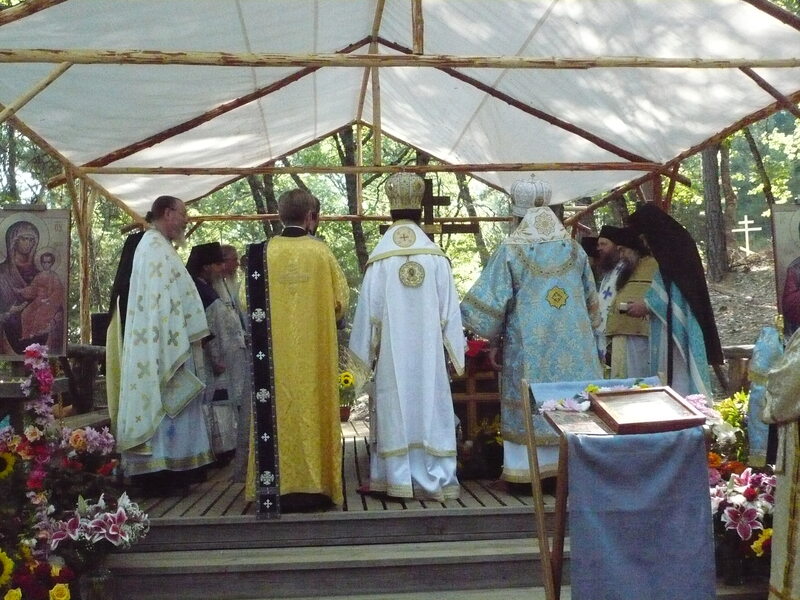 One of the many blessings of the weekend was to have present the Vicar Bishop Daniel from Bulgaria who presided with such dignity and grace, one could truly sense that the Liturgy was that one service that united Earth to Heaven. His homily on the ever memorable Fr. 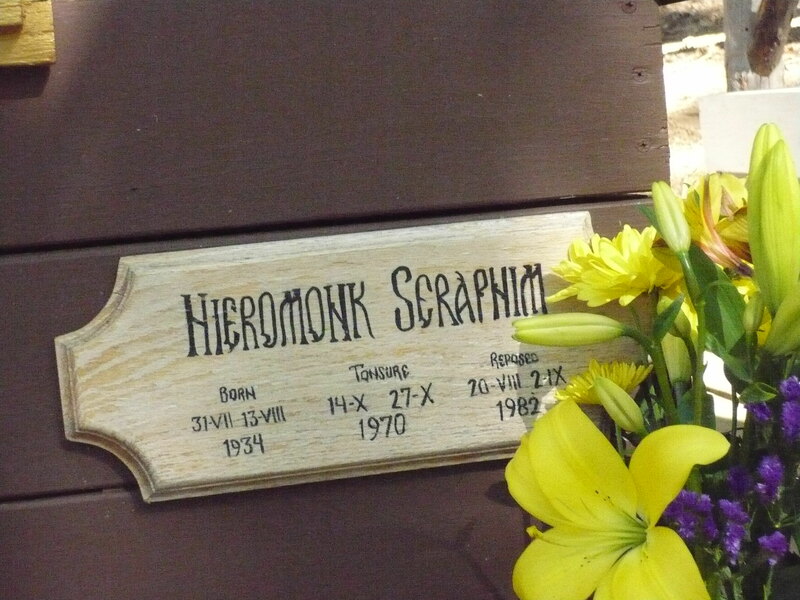 Seraphim reminded us all how much this simple monk had influenced the 20th century world, bringing many to the faith and deepening the faith of those who were already orthodox. Pilgrims began to pour in that afternoon and after the evening meal we began the All Night Vigil. There are three things that come to mind about that night. The monks harmonious singing united in heart and mind was especially beautiful and the icons seemed to glow with a special radiance allowing us a small glimpse into the heavenly worlds. As the evening progressed the priests set up places outside to hear confession where one could let go the burdens of our sinful world. It was especially awesome to confess under the blanket of heavens with the whole creation there to hear our pleas and prayers. After my confession under the stars I wandered back to the open church doors, framed in candlelight and illuminated by the power of the Great Doxology being chanted in the nave by all the brothers there. I remember the domes of the church set against the backdrop of the stars and the glorious moon and the open doors of the church welcoming us to come and worship the Creator of All Things, the only Lover of Mankind. Early Sunday morn more pilgrims began to arrive and the energy picked up as we all met outside the grave site of Fr. 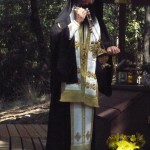 Seraphim to chant the Divine Liturgy. 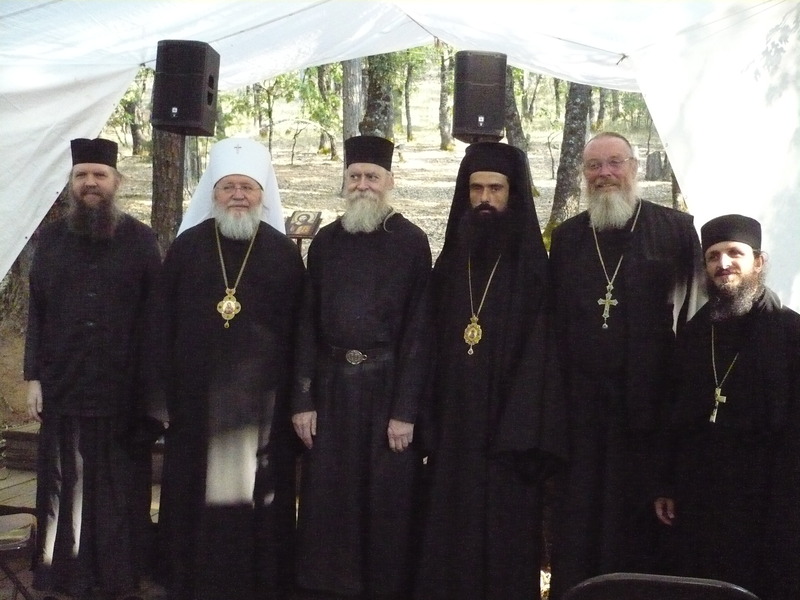 Metropolitan Hilarion of the Russian Church Outside of Russia and Bishop Daniel co -presided with many other priests from around the world. Now the glory of the sun rays shone through the tall trees and the gentle wind and bird song was everywhere praising God from whom all blessings flow. The women had made beautiful bouquets of flowers of all varieties that lined the stairs leading up to the coffin and even a flower cross honoring our dear Fr. 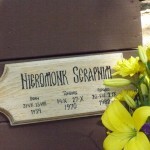 Seraphim who had touched each of us in some special way. The incense was especially sweet when mingled with the flowers as it arose asking God to accept our morning prayer. I remember the richness of the vestments, the intricate colors and details reminding us of the beauty of the heavens and that the very Lord Himself our King, was ever present Robed in Majesty. After the Liturgy, a communal meal was served buffet style with tables set up in the courtyard so that we could dine outside in the glory of the summer day. 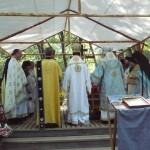 Following the meal those who were present gathered at a covered pavilion where people who knew Fr. 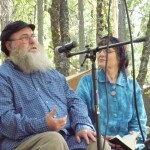 Seraphim personally were asked to speak about their memories. 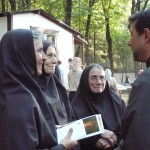 Metropolitan Hilarion, Mary Mauseur, Fr. Damascene, Soloamnia, Seraphim and Martha Nichols, and Martinian Prince all gave us vivid pictures of a man whose life was completely dedicated to God and Truth, His only Begotten Son. Some words to describe Fr. Seraphim were as follows: deeply humble, completely rooted in the Holy Fathers, bold in presenting the present world view that comes from the evil one and fallen man, great integrity, gentle and unassuming, considerate and hospitable, yielding when necessary, non-judgmental, long suffering, great compassion for fallen mankind, great desire to bring all to the Truth, sober and serious but still maintained a sense of humor, always exuded a sense of deep peace and tranquility. As the day was coming to an end and it was time to leave we all yearned to stay together here in our love and memories and prayer. 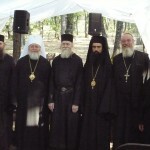 As we drove away from the monastery and our cell phones turned on and the drone of the traffic and the wailing of the fallen material world began to press down upon us again, we turned to our hearts and thoughts knowing that this passing world could never touch the precious experience we had just been witness to.With great gratitude to God, Abbot Hilarion and all the dear brothers of St Herman’s we each took some of this blessing out into the world to our brothers and sisters who had not been there. Glory to God who is wondrous in His Saints and His unending Love for all Mankind. 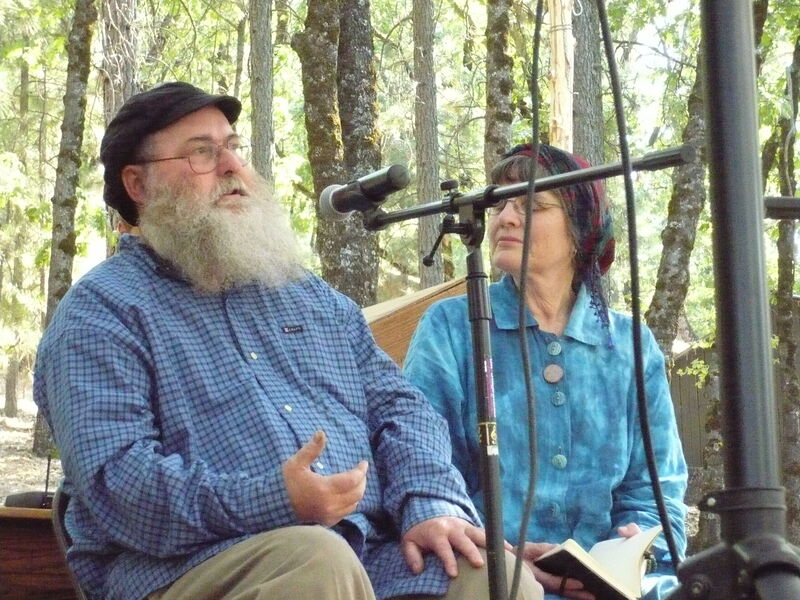 Thank you Anna, for this richly-told reflection, which captures so much of the time spent there, and the peaceful, joyous atmosphere that blessed all of us fortunate enough to attend. It certainly was the highlight of my Church year, and will be an inspiration for my life in Orthodoxy as we embark on our New Year. Our moonlit visit to Nana Agafia’s grave was a sorrowful joy that will remind me always of the heavenly Homeland we journey towards, and those who await us in the unspeakable joy of our Lord. Warmest greetings to Fr. Andreas, and all the parish. Warm greetings back to you. I am very much looking forward to meeting you one of these days, if the Lord wills. Know that you and your family always are welcome to stop over in Ashland whenever you are driving through.